If you have know Jquery Bootgrid Plugin is extremely accepted html table grid plugin and mainly developed for Bootstrap. So we can easily integrate this Bootgrid plugin with Bootstrap framework. 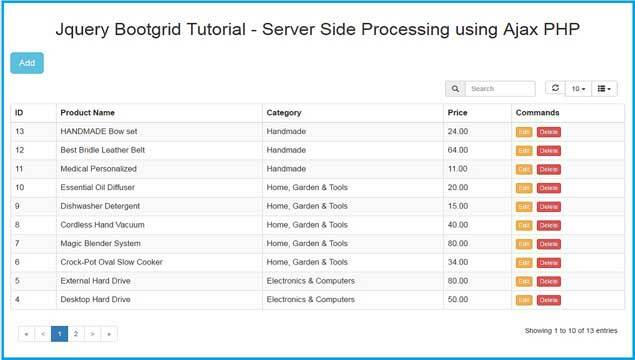 In this post we will discussing on how can we do server side processing with Bootgrid plugin by using PHP Ajax. This post helps you to do server side operation like fetch or select of data from table with all Bootgrid plugin functionality like searching table data, pagination, column sorting and many more. We will also see how to add or insert data into mysql table by using PHP Ajax and load inserted data on Bootgrid plugin, how to edit or update Bootgrid table data by using PHP with Ajax and Bootstrap modal and lastly we will also learn how to remove or delete data from Bootgrid data and display available data on Web page under Bootgrid table. Bootgrid is extremely well build jquery grid plugin that is used to change a simple HTML table into powerful grid with extra ordinary functionality like table column sorting, pagination, searching table data from server side, and insert, update and delete records features. We will learn following functionality of Bootgrid plugin by using PHP Mysql and Ajax. So, In this post we will simply combine two table data by using Inner join query and after this we have put certain condition if Bootgrid send request for searching of data then we have put search data query condition at server side, if Bootgrid plugin send request for sorting of data then at server side we have put condition for sorting of data and many more. In Jquery Bootgrid plugin we can not fire jquery click event on button, so for this we have load Bootgrid constructor for this, after loading Bootgrid constructor we can fire click event on Edit and delete button and after this we have send ajax request for edit or delete of data at server side. So this way we have perform all Bootgrid operation at server side by using Ajax PHP. I got three div on my page. I can see only a "loading.." as Datas. Add new works, so i think can not be a Database Problem. Have you a hint for me?